The Application form of Veltech Technical University Engineering Entrance Exam will be made available to its aspirants in the first week of October 2017 for Phase I and II in both online and offline mode. The application process of VTUEEE 2018 is covered in six stages including online registration, filling up the application form, choosing exam centre and the payment of registration fee. Interested applicants also have to upload scanned images of their passport size photograph and signature in VTUEEE 2018 application form as per the specification of University. 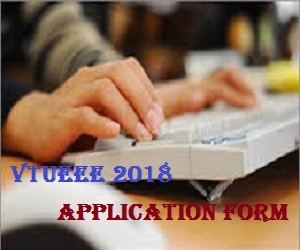 Read the full article to know the process of VTUEEE 2018 Application Form. From the Regional Offices of Veltech University / Book shops on cash payment of Rs.950. By sending DD of Rs.950 drawn in favour of “ Veltech Dr.RR & Dr.SR University”, payable at Chennai, to The Director - UG Admission along with a requisition letter containing the full address of the applicant. Here is the list of required documents and details that a candidate has to keep it along with them while filling up the VTUEEE application form 2018.